Oh my goodness I'm actually making a proper blog post! How exciting haha. In May of this year, I took a dramatic leap and lightened my hair. I have naturally dark brown hair and have been dying my hair black for nearly a decade. 10 years of box dye? "Stylists hate her!" Since January of 2015, I've been speaking with my amazing stylist, Holly Brooke (Rain the Salon & Day Spa), about lightening my hair and going a red/orange. We decided it was best for me to let my hair grow out as much as I could stand and then start on the long process of removing ages of box dye. It took multiple sessions to get all the dark out of my hair without ruining in my hair in the process. From all of this, I have learned a massive amount about hair care and learned how to properly take care of my lightened hair, keep it soft, and retain the colour. When my hair was black, I washed my hair daily, dried and straightened my hair, and did little else to it. My hair would never hold a curl and while it was always silky and soft, it was flat and boring. I've stopped straightening my hair entirely. When I heat style my hair, I use hair wands. The two wands that I use are from NUME. I have a 32mm barrel and a reverse barrel (25-13mm). I love these wands. The reverse barrel is BY FAR my favourite. The curls look gorgeous, last all day, and my hair is super bouncy and full of body. The 32mm barrel is great also, but since the barrel is larger, the curls are more of a "wave" and just add a little body to my hair. Once I curl my hair, I like to set my curls with Dove style + care flexible hold hairspray. I really enjoy this hairspray. The smell is pleasant, not overpowering, and it keeps my curls intact without making my hair feel like it's cemented or crunchy. Since my hair is red, the colour can fade pretty quickly. Every wash lightens the "vibrant" red/orange that I love, so I have to watch what I use on my hair and how often I wash my hair. I have gone from washing my hair every day to twice a week. (that was a nasty first few weeks...glad that's over with!) Now that I've stopped washing my hair as often, my hair doesn't produce as much oil, so it doesn't seem so dirty. By the end of the third day, I may feel a bit grimy, but dry shampoo has been my BEST FRIEND. I've tried Pantene dry shampoo (NEVER. AGAIN. ), Batiste dry shampoo (works, but I don't care for the smell), and I was a little let down with some other ones...until I was suggested to try PSSSST! Let me tell you, this stuff is amazing. The smell is almost non-existent and it does wonders for dirty hair. You can get it at Ulta, CVS, or Amazon. Here is a link if you would like to try it out! It's really inexpensive. Ok, back to hair washing. Since my hair is red, I need to use a special shampoo to keep my hair silky, vibrant, and just all around healthy. I tried John Frieda red hair shampoo/conditioner and while I liked it, I just didn't feel like it was the shampoo/conditioner combo for me. I was recommended to try Overtone colour depositing conditioner and I was NOT disappointed. It is sulfate free, vegan, and organic...so why wouldn't I try it? On the left I hadn't washed my hair in four days so it was a little icky haha. The right was the next morning after I used the conditioner. Look at that vibrancy! 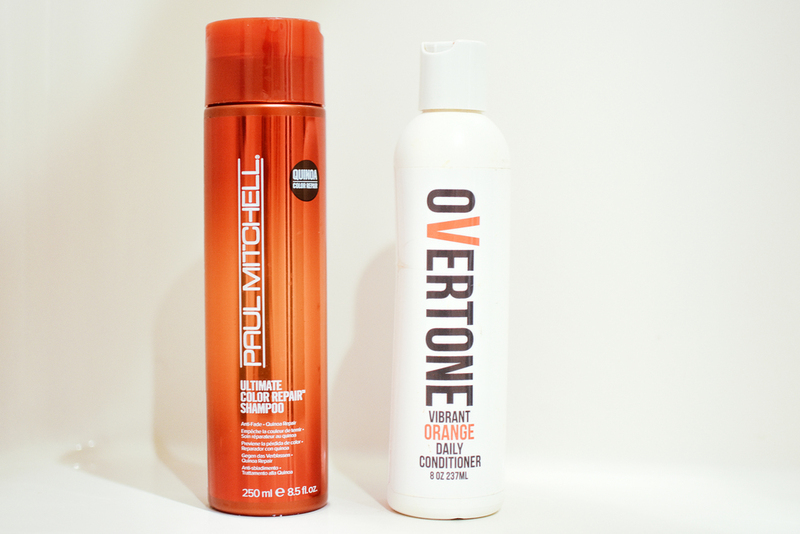 For shampoo, I've recently started using Paul Mitchel Color Repair Shampoo. It makes my hair feel amazing. It doesn't lather up because it is sulfate free, but it feels so great when i'm washing my hair. The consistency is almost like a conditioner. More lotion-y instead of soapy. The smell lasts all three days and my hair feels so thick and soft! On the days I wash my hair, once I towel dry my hair, I like to put about a quarter-sized dollop of Nume's Argan oil on the end of my hair. This isn't an immediate miracle for my hair, but it certainly does keep my ends soft and I've noticed that they don't look so dry on the dry shampoo days. This stuff is also great for when you need to smooth out a ponytail or a bun/updo. Every week or so I also like to put some on my scalp as a leave in conditioner if I notice my scalp getting a little dry. Whew! It you've made it to the end I really appreciate it! I'm terrible at keeping things short, so I hope this was helpful for you! I stand by these products and I am happy to have found such amazing things for my hair. If you have any questions, just leave a comment and I'll do my best to answer!